These Kachoris, filled with spiced split, skinless Black Gram Dal, are different from Khasta (crisp) Kachauris that are eaten as a snack. These are traditionally made, along with Poories, on festivals and special occasions. In our Gupta families, they are usually served with Potato Curry, Pumpkin Curry and Boondi Raita. They are at their best when served straight from the pan, hot and crisp. Serves 5-6. Soak the dal for 2 hours, drain in a colander. Place dal in a food processor, along with ginger and green chillies. Grind to a COARSE paste. You may need to add a little water, but don't make it runny. If it is, then fry it in a wok or karahi until dry like dough. Cool. Take it out in a large mixing bowl, add all spices and mix. Keep aside. Place flour in a bowl and add water, a little at a time, and make a soft dough. Knead it well. Keep it covered with a moist cloth/handkerchief. Divide dough into small portions to make golf size balls. Flatten each ball between your oiled palms. 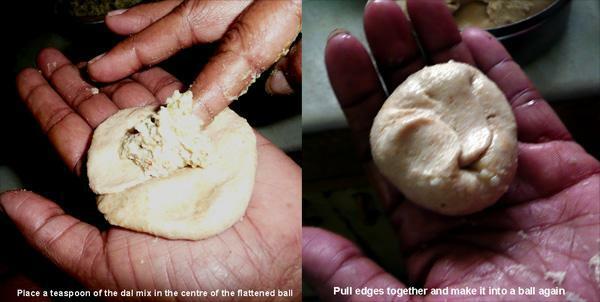 Place a teaspoon of the dal mix in the centre of the flattened ball, pull edges together and make it into a ball again. Make all balls and keep them covered with a moist cloth. Heat oil in a wok or karahi. To check if it has reached correct temperature, drop a small piece of dough in the oil. It should sizzle and float to the surface quickly and the oil should not be smoking. If it is smoking, it is too hot and will burn the kachauries. Turn heat down a little. Grease one ball at a time with oil and roll it out to 5-6 inch diameter. You can do this in a Poori-press, gently. Traditionally, they are made by flapping a stuffed and greased ball too and fro, between oiled palms, until you get the required size and thickness (see pictures). This requires practice though. 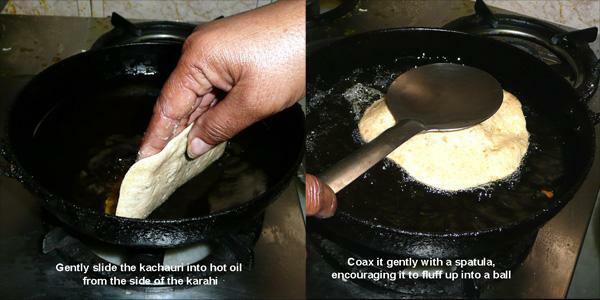 Gently lift the kachauri and slide it into the hot oil from the side of the karahi. If dropped from a height, it can splash hot oil on your hand. Once the kachauri floats to the surface, turn it over and press it gently all over with a skimmer or spatula, encouraging it to fluff up into a ball. Fry on both sides until golden colour and a little crisp. Serve hot with Rasedar Aloo. You can make 'pitthi filling' this way too. Grind dry, skinless urad dal coarsely and soak in double the amount of water (1:2 dal:water). Now add all other ingredients. It is easier if you have two people making kachauries, one rolling them out and one frying. If you have a poori press, it makes the rolling out process easy. Left over kachauris freeze well for another day. Reheat on a hot griddle or tava or a frying pan until crisp on both sides. Serve with pickles and lassi (yoghurt drink). For short cut, soak approximately 200 gm of dal Baries from your kitchen cupboard in enough warm water to just cover them. In this case, you will not need to add any spices, except salt. Simply mash the soaked baris, add to flour and make dough as described. Baries are mostly bought ready made now, but my mum's generation always made them at home.